PARA GARANTIZAR LA RESERVA ES NECESARIO LA ENTRAGA DE UN 25% DEL TOTAL DEL GRUPO. EN EL MOMENTO DE LA CONFIRMACION. EL RESTO DEL IMPORTE DEBE ESTAR ABONADO 4 SEMANAS ANTES. HASTA 30 DIAS ANTES 1 NOCHE DE GASTOS. ENTREL 30 Y 15 DIAS ANTES 50% DEL IMPORTE. ENTRE 15 Y 7 DIAS ANTES EL 75%. 7 DIAS ANTES DE LA LLEGADA DEL GRUPO 100%. CONSULTE CONDICIONES ESPECIALES SEMANA SANTA Y FERIA DE SEVILLA. 25% DE DEPOSITO PARA CONFIRMACION. RESTO CONSULTAR DEBIENDO ESTAR ABONADO LA TOTALIDAD DEL GRUPO 4 SEMANAS ANTES DE LA LLEGADA. LA PROPIEDAD PUEDE SOLICITAR UNA FIANZA O GARANTIA A LA LLEGADA DEL GRUPO QUE SERA REEMBOLSADA A LA SALIDA SI NO EXISTEN DESPERFECTOS EN LAS HABITACIONES. 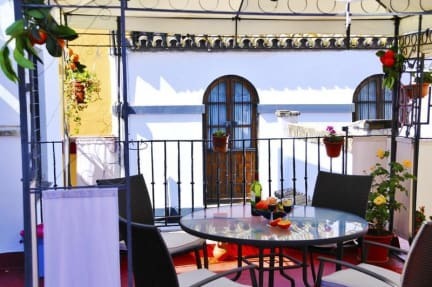 The guest house “La Montoreña” occupies a typical Andalusian house in the district of Santa Cruz, in the historic center of Seville, and has a central courtyard and a large rooftop terrace. The Montoreña offers rooms and apartments. The rooms have private or shared bathroom. The apartments have parquet and feature a modern kitchen equipped with a stove. Air conditioning and heating is also available for an additional fee. 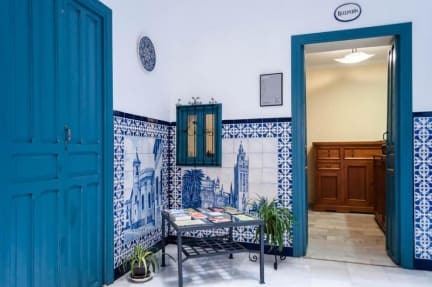 The guest house is located just 5 minutes walking from the cathedral and the Real Alcazar of Seville, a medieval Moorish style palace that has been declared a World Heritage Site by UNESCO. The train station of Santa Justa and the shops are near the center like 10 minute walk. Seville's historic center is a great choice for travelers interested in architecture, eat some tapas and a good atmosphere. Our customers say that this part of Seville is their favorite, according to independent reviews. If you reach our accommodation outside these hours must check-in at The guest house Perez Montilla, 50 meters walking, where he will attend and give the keys to your room. - Free WIFI. The WiFi signal is not too strong in some rooms. - PRIVATE PARKING is available nearby. You can not book it. Price: 18 € / day. For more information, see reception at check-in. - All children are allowed. - FREE ! 1 child under 5 years (s) stays free of charge WHEN USE AN EXISTING BED. - A baby 2 years or less old is charged EUR 15 per night per person for a cot. - Extra cost of 15€ per night for any child or adult that requires an extra bed. - Additional beds and cots are available upon request and must be confirmed by the property. - Please note that all special requests are subject to availability. - Extra charges like additional beds, cots, parking, etc will not be calculated automatically in the total price and have to be paid at the check in time. - When booking more than 2 rooms, different policies and additional supplements may apply. - No special prices are applied for group reservations. -The stablishment could request a deposit at the check-in time in order to guarantee any material damages and bad behavior. - For long stays, towels and bed linen will be changed every 3 days. - The stablisment applies an extra cost for a daily change of towels and bed linen. - Guests must show valid ID and credit card upon check-in. - Special Periods: From April 2019, 12th to 21th and from May 2019. 1st to 12th: The total amount of the reservation will be charged at least 30 days before the arrival. FREE CANCELATION up to 30 days before arrival. Cancellation or Modification after the deadline or No Show will have expenses of the total amount of the reservation. No Smoking in Room According. Law 42/2010 of 30 December.